While a bit more specialized than certain types of saw or sanders, an angle grinder is an incredibly versatile tool that can, and should, find its way into every tool belt. With the ability to cut, sand, polish, sharpen, clean, and grind, there is so much this tool can do, it does not make sense not to have one. However, figuring out which one is right for you can be tricky. With different power sources, motor powers, and disc sizes—not to mention materials—choosing an angle grinder can be a confusing task. That is why we have provided a list of the general best angle grinders on the market today as well as a couple niche items. Then we have produced a thorough buyer’s guide with the most relevant considerations to give you the power to make an informed choice. The first product on our list comes from SKIL, a manufacturer who used to be known for high-quality, professional grade tools but whose reputation soured. However, they have made a commitment to reclaim their professional grade reputation and this angle grinder is off to an admirable start. At 7.5 amps, the motor provides the power you would expect out of a professional grade angle grinder and the 11000 rpms is more than enough for most jobs. Moreover, this grinder features a sidebar that can be placed on an overhead position for a variety of handling position. The paddle switch also features a no-lock trigger, which provides a bit of safety. However, the absence of a trigger lock will also necessitate that you hold the trigger down for continued operation which can lead to hand fatigue over a long period of time. This would not be so bad except the shaft is also somewhat large and does not feature any rubber grips. Combined with the hefty 6.15-pound weight, this is not an ergonomically designed angle grinder. Makita is known as being one of the top 3 brands for power tools on the market today—along with Bosch and Milwaukee. This is the first of 3 Makitas, and each provides something a little different. This Makita is our only 4” disc diameter angle grinder. While the slightly smaller disc may limit some of its versatility, this grinder provides a wealth of power for its size and is well suited for a wide variety of tasks. However, the motor itself is a bit underpowered at on 6 amps. Moreover, the 4” disc will not be large enough for all of the cutting tasks you might have. Still, this tool is a breeze to use. At only 3.7 pounds, this is the lightest angle grinder on our list, making it easier to use for longer periods of time. This ergonomic design is only enhanced by a slim 2 ½” barrel shaft that features a rubber grip at the end. This tool also comes with an excellent quality carrying case, though the case is a bit on the smaller side. DeWalt angle grinder is somewhat in the same boat as SKIL. Once known as one of the top power tool brands for professional grade quality, their reputation has soured a bit after being bought out by Black & Decker which led to a decline in their tolls’ quality. However, DeWalt is still recognized as a professional grade brand. The first of our two DeWalts is the most powerful 4 ½” angle grinder on our list. With an 11 amp motor, this angle grinder is as powerful as many grinders which feature a disc much larger in size. Moreover, 11000 rpms is plenty for almost any job, and this is one of the few grinders on our list to provide a horsepower rating. At 1.8 hp, you can be sure this motor is more powerful than any except the 7”. However, this angle grinder does come with a few design flaws. First, the guard is made out of a flimsy material that is not at all suitable for cutting purposes. If you wish to use this grinder for cutting, you must first purchase a second guard. To make this more unpleasant, the trigger is located to close to the disc, which makes the iffy guard even riskier. Our second Makita is a bit of an iffy buy. Specifically, there are some less than reputable distributors out there who provide this product. Unfortunately, those unscrupulous distributors are more than willing to sell a refurbished of malfunctioning product as new and provide no customer service thereafter. As such, it will be incumbent on you to figure out which distributor you should trust—and Amazon is not a sure-fire bet in this regard. Still, this angle grinder does come with some nice features and extras that can make it a good deal, assuming you purchase it from the right distributor. The included case is one of the best angle grinders for welding on our list. Its housing is made from aluminum with a zinc finish. This will keep your grinder safe from damage and prevent rusting. Moreover, the inside features an injected molded interior to keep your grinder secure in transit. Still, at 4.5 pounds, this angle grinder is a bit on the heavy side, which does reduce the potential portability that the superior case provides. Moreover, this grinder features a locking trigger, which can be nice for extended use but also may present a safety risk in untrained hands. Our second DeWalt is nearly as good as the first, and may even be considered better depending on what you are looking for. First, while this DeWalt’s motor is not quite as powerful as the previous model’s, it still features a robust 7 amps. Moreover, this DeWalt actually features the highest rpms out of any product on our list at 12000. This makes the DeWalt exceptionally effective at cutting metals and other hard materials. Unfortunately, this DeWalt also suffers from some of the flaws as its predecessor. First, while not quite as heavy, this DeWalt is still pretty hefty at 5 pounds. Moreover, this DeWalt also has the same large profile which makes using it for extended periods of time more liable to cause hand fatigue. This would not be as much of an issue, but the design of this angle grinder leads it to be somewhat difficult to control. With a lighter profile and more rpms, you will need to be careful that the torque does not get away from you. Thankfully, this angle grinder does not include a trigger lock, so you do not have to worry about accidentally injuring yourself or others on the jobsite. 12000 rpms is the highest speed rating on our list. WEN is not a well-known or especially well-respected brand in the power tool market. They do not produce professional grade products, and as a result, find it difficult to get noticed. However, WEN excels at making consumer grade products that can compete with any other in its class, and this angle grinder is a prime example of that. At the lowest price out of any product on our list, the WEN still provides a surprising amount of power. While just a hair underpowered, the 7 amp motor is still nearly on par with professional grade quality, while the 11000 rpms is exactly what you would expect from a professional grade angle grinder. Unfortunately, this product is also a bit heavy. While 4.6 pounds is not the heaviest 4 ½” angle grinder on our list, it is definitely nearly the top. Thankfully, the WEN features a shaft that is almost entirely covered with a rubber grip. Moreover, if you know what you are doing, this angle grinder features a trigger lock to help prevent hand fatigue from extended use. Other than Makita, Bosch is the other top 3 power tool brand to make our list. However, Bosch and Makita often trade positions based on what tool is reviewed and what the user needs. Generally, the Makita will provide more raw power, but the Bosch will provide a better value with more durability. In the 4 ½” angle grinder category, the Bosch ultimately provides the most value, and is superior to pretty much every angle grinder in its class that we reviewed. While it is not the cheapest product on our list, it is incredibly reasonably priced for a truly professional grade power tool. The 7.5 amps and 11000 rpms are about what you expect in this class. Moreover, the Bosch somehow managed to keep their angle grinder under 4.5 pounds, at only 4.2 pounds. Combine this with a trigger lock, and you have an angle grinder that will not cause hand fatigue as quickly as some other. Unfortunately, the shaft features no rubber grip, so you better know what you are doing if you engage that trigger lock. 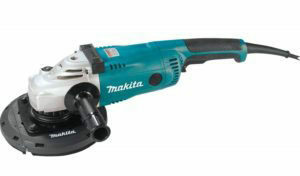 Our final Makita is also the only 7” disc diameter angle grinder on our list. Keep in mind, a larger disc diameter does not necessarily mean a better tool. Instead, the large disc diameter puts this tool in a different category altogether, and it will be better suited for some jobs and no other. 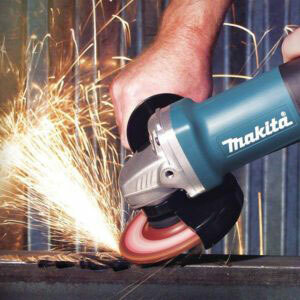 To point, this Makita is probably the best angle grinder on our list if you want to cut metal or other hard materials. That is in a large part due to its power, which is produced by a beastly 15 amp motor. That being said, this angle grinder does run a touch slow at only 10000 rpms, but it more than makes up that speed with an increased torque. 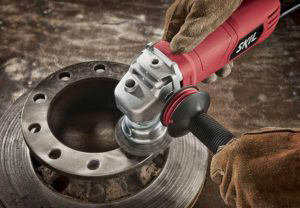 However, with the powerful motor and increased torque, this angle grinder is not at all suited for softer materials. Another issue with the power is that this angle grinder can be difficult to control. Part of this has to do with the power, but another part has to do with the fact that at 12 pounds, this is easily the heaviest angle grinder on our list. In another odd choice, the Makita is designed to fit the lesser used depressed-center discs instead of the more common flat-centered discs, and will require and additional flange to use flat-centered discs. Black & Decker BDEG400 6-Amp Angle Grinder, 4-1/2-InchOur final product for review is a Black & Decker. This brand has had some ups and downs, but it has never strayed too far from the consumer grade category. Moreover, even within that category, it often struggles to compete against some of the up-and-comers like SKIL. Still, the Black & Decker has a market and appeals to that niche specifically. First, this angle grinder is almost as cheap as the WEN, which still makes the price point incredibly attractive—especially to the weekend warrior. However, it is this angle grinder’s dedication to ergonomics that truly dig out its niche. 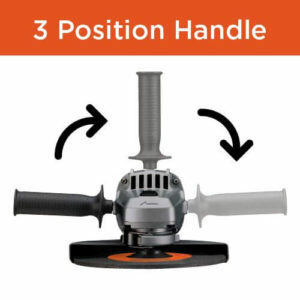 First, the grinder features a 3 position side handle, so you can use it with an over handle if desired. Moreover, the shaft features a graduated design which will fit easier in your hand over longer periods of use. Unfortunately, Black & Decker were unable to keep the weight down, which will decrease some of its long term ergonomics, as this angle grinder weighs in at a portly 4.85 pounds. Finally, the power and speed are not quite up to professional snuff at just 6 amps and 10000 rpms respectively. More than any other factor, this will determine the extreme limits of what you need from an angle grinder. 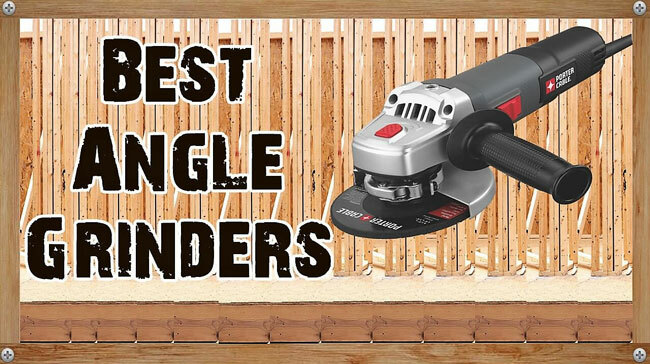 Despite its name, angle grinders are used for a whole host of jobs other than grinding. For example, when cutting metals, it can be incredibly effective and convenient to use an angle grinder with the proper disc. Conversely, an angle grinder can also me used to sharpen or polish metal. 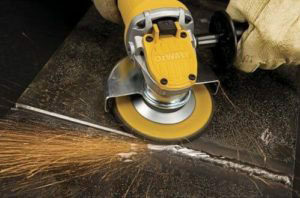 For non-metallic material, the grinder can even be used as a sander or an impromptu lathe for shaping—though, an angle grinder can accomplish both tasks with metallic materials as well. If you never intend to use the angle grinder to cut through metal pipes, then there is no reason to spend the extra money getting a top of the line angle grinder for which its highest demand features never see use. 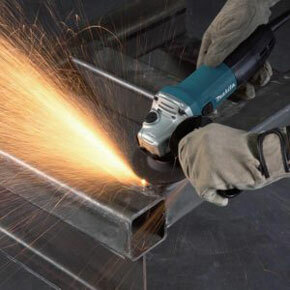 Of course, angle grinders which are rated to accomplish some of the more punishing tasks are often better at producing the best results for the more routine ones as well, so the quality of the tool—and the job itself—may influence you to purchase an angle grinder with capacities that will rarely, if ever, see use. A purview across the internet will turn up a couple results here, however, there are generally 2 primary indicators of an angle grinder’s power—not 3. The two that matter most are volts and amps. These two qualities apply to cordless and corded angle grinders respectively. The outlier that many people will bandy about is watts. However, watts is a measurement of amps and volts. Moreover, while corded angle grinders are generally measured in amps, they, of course, have a voltage—generally 120. The same applies to cordless angle grinders—though the amps may vary a bit more there. Regardless, the main thing that you are looking for with power is to give you a quick estimate of the product’s grade. A professional grade product will always produce superior power, though there will be the occasional consumer grade product with professional grade power. However, those products will always have some other fatal flaw, or a few, that prevent them from being able to stand up to the rigors of continuous professional jobs. When it comes to corded models, there is a bit more wiggle room. For this type of angle grinder, you can find an amperage rating of anywhere between 4 to 15 amps. For corded models, the power standards are a bit more regular. Corded power tools—regardless of the type—generally come in either 10.8/12 volts or 18/20 volts. Technically, pneumatic angle grinders also exist. 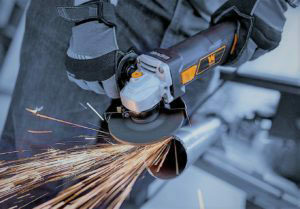 This type of angle grinder uses pressurized air to generate its power and is measured in pounds per square inch or PSI. However, this angle grinder will either require a portable air compressor or, more commonly, a dedicated air compressor on site. As such, pneumatic angle grinders are more likely to be found in a dedicated workshop or other professional settings where a large compressor can continuously feed the grinder with compressed air. The speed of an angle grinder is measured in rotations per minute, rpms, of the disc. However, this is not a situation where more is always better. Unlike with power, the higher the speeds, the more suited the angle grinder is for different jobs. In this regard, there is a handy rule of thumb: higher speeds are better suited for cutting, while lower speeds are better suited for polishing or sharpening. If you use a grinder with either too high of a speed or with a speed setting that is placed too high for sharpening a blade, you are liable to simply chip and pulverize the blade’s edge into sparks and metal slivers. Conversely, if you try to cut through a metal pipe at too low a speed, it will take forever and you will likely have to go through multiple discs before you get the job done. Angle grinders will come with rpm rotations between 4000 to 10000. If the grinder does not have a maximum rpm of at least 6000, it will not be suitable for cutting. Similarly, if the grinder does not have a minimum speed below 6000, it will not be appropriate for sharpening most metals and will not really be suited for polishing anything except in the most skilled of hands. Discs, or wheels, have two size ratings: diameter and thickness. The diameter of the disc is more important if it is to be used for cutting. A disc with a larger diameter can cut through the thicker material than a disc with a thinner diameter. However, it is a convenient trick to use a smaller diameter disc when you do not want to cut entirely through the material and simply with to score it. Of course, this requires a far higher degree of skill and should not be tried by amateurs. 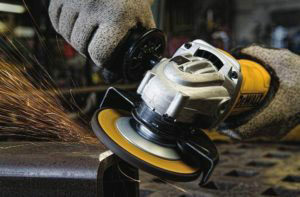 The thickness of the disc may play an important factor for cutting purposes, but it is generally more relevant for the other uses of an angle grinder. The thickness of a disc is especially important if you need to polish or sand something down. It can also be relevant to sharpening edges, though not quite as much as with polishing or sanding. Another important factor to consider with the discs is the material of the disc itself. Different materials will have different purposes with the harder materials generally being better suited for cutting purposes. Keep in mind, each task you ask of your angle grinder will have a corresponding pad that is most suited for the job. For example, a diamond disc is more or less necessary for a quality cutting action. However, aluminum oxide can also serve to cut softer materials while still sanding down wood as well as buffing or polishing harder materials. If you only buy one angle grinder, your best bet is to go with the Bosch. 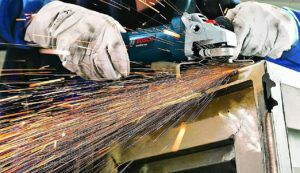 While some angle grinders might be bigger or more powerful, the Bosch provides professional-grade power with the reliability of its brand at a price point which provides the best all-around-value. However, if you find you need something with a little more oomph, both DeWalt features a more powerful motor, though they both are more difficult to control. If you find you need exceptional power, your best bet it the 7” Makita which offers a 15 amp motor that cannot be topped on our list. However, if you are not a professional, there are still plenty of solid consumer-grade options available. SKIL is the best performing consumer-grade angle grinder, though the WEN provides the best cost while producing a solid angle grinder. And if comfort is your primary goal, it is hard to go wrong with the Black & Decker.